For Burning Man 2003, I'm building a big MIDI-controlled lyre. The frame holding 24 strings will be 9 feet high, and the very top will be almost 12 feet high. Each string of the lyre will be a rope light, independently controlled from a set of 24 MIDI-controlled relays. Surrounding the lyre will be 4 dance pads. As people step on the dance pads, looping-style music will be generated, and the strings of the lyre will flash correspondingly to the music and in a wild variety of patterns. Here's the complete list of Theme Art installations for Burning Man 2003. I got these cute little 30-watt amplifiers - it's the little half-spherical thing next to the speaker. I'll be using 2 of these amps, driving 4 speakers. Each speaker will play the music being generated by the dance pad closest to it. A pile of light rope. A pile of PVC pipe joints. The frame of the lyre fills the living room floor. The base of the lyre - there will be ropes from the top of the lyre, so the base doesn't have to keep it upright, although this still might be not be wide enough. To plug the lights in and connect them individually to the MIDI relays, I hacked up some power strips and 3-prong adapters. One connection on each adapter goes to the plug attached to the side of the power strip. The other side the power strip. This is the circuit board which takes MIDI in and converts it to signals that drive the relays. I purchased the ciruit board, but made the case from scratch. is taking and how long the battery will last. We have ignition. The first light is lit. The first 6 lights are now connected and flashing under MIDI control. All 24 light-ropes are now set up. 6 lights per strip, 4 strips, all wired for connection to the relay box. The computer and synthesizer I'll be using. The controller and relay board, in their boxes. Same boxes with the covers on. The case I'm putting all the electronics in. Holes on one side for fans. Holes on the other side for intake. And the box is filled to the brim with cords and electronics. At night, the lights in the box will look kinda cool, but I'll need more lights when I need to see what's going on. Here's one of the two curly-Q's that will go at the top of the lyre. The two curly-q's are laid out on the floor in the appropriate position, but my living room isn't tall enough to raise the entire structure! TADA! The body of the lyre is raised for the first time. The strings need tightening, it appears. Some context, to show how it fills the living room. Our ceilings are 9 feet high. At the base, I've got a couple of shallow white boxes to hide (and protect) the ugliest part of the wiring. Now I've got the side parts added on, and some crude support for the top bar. The curly Q's will attach to the top-left and top-right corners, and will extend upward several feet. I changed the strings so they are single-strands rather than double-strands. The double-strands seemed almost blindingly bright, when flashed at high speed, especially at close range, so I wanted to tone them down a bit. I will take the original double-strands, though, to burning man, in case I need/want more brightness. 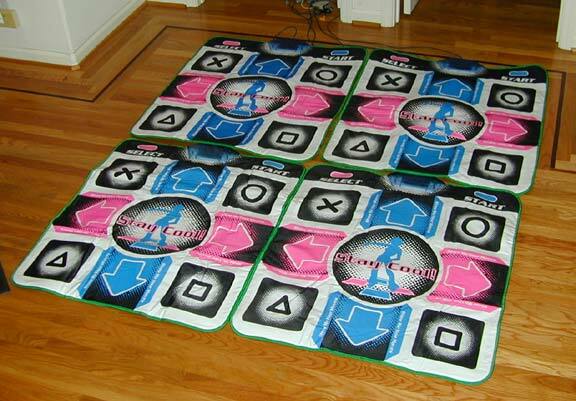 You can see the dance pads here. It's getting hard to fit the entire thing in a picture. I covered the dance pads in fabric, and put some pictures of the Muses on them. Then covered them in 20mil (I think that was it) clear plastic. I have thicker translucent pads, if this plastic isn't strong enough. Two weekends before burning man - I set it up in the driveway, as a trial run. Here the pieces are laid out. Ta da! This was the first time I actually assembled and saw the whole thing.